Corris Steam Railway & Museum01654 761303work Steam RailwayThe Corris Railway is a narrow gauge (2 foot 3 inch) railway whose origins date back to the 1850's. The line was initially built as a horse-and-gravity worked tramroad to carry slate from the quarries of Corris Uchaf and Aberllefenni in southern Merionethshire to the nearest navigable point on the Afon Dyfi (River Dovey), where it was loaded into ships and carried to its diverse destinations. In the 1860's the line ceased to deliver direct to shipping and instead transhipped its slate to the standard gauge railway at Machynlleth, in western Montgomeryshire. A semi-official passenger service, using adapted wagons, flourished in the early 1870s. In 1878 the line was acquired by a London company, Imperial Tramways Ltd and three steam locomotives and ten purpose-built passenger carriages were introduced, although due to a dispute with the quarry owners, passenger services were suspended until 1883. For the rest of the nineteenth century the Railway was very prosperous, developing a substantial tourist traffic. From 1892, Imperial Tramways was based in Bristol, sharing offices and management with the Bristol Tramways firm. The twentieth century brought with it a decline in the slate industry, followed by increasing competition from road transport. The railway ran its own successful bus services, using vehicles provided from Bristol and it was probably more a desire to control these services than to acquire the Corris Railway itself that led to the Great Western Railway purchasing the line from Imperial Tramways in 1930. Soon afterwards passenger services were withdrawn. The line continued in use for goods only until 1948, when it became one of the first to be closed by the newly-nationalised British Railways. The line was dismantled soon after closure, the surviving locomotives and rolling stock finding a new life on the nearby Talyllyn Railway, where they are still to be seen in operation. 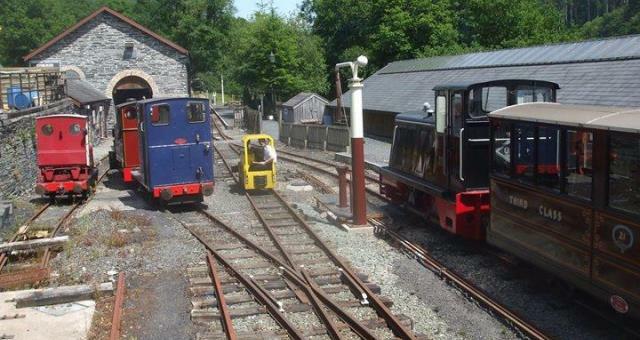 The Corris Railway is a narrow gauge (2 foot 3 inch) railway whose origins date back to the 1850's. The line was initially built as a horse-and-gravity worked tramroad to carry slate from the quarries of Corris Uchaf and Aberllefenni in southern Merionethshire to the nearest navigable point on the Afon Dyfi (River Dovey), where it was loaded into ships and carried to its diverse destinations. In the 1860's the line ceased to deliver direct to shipping and instead transhipped its slate to the standard gauge railway at Machynlleth, in western Montgomeryshire. A semi-official passenger service, using adapted wagons, flourished in the early 1870s. Trains leave Corris Station on the hour from 11.00am to 4.00pm, with a round trip taking 50 minutes, including a guided tour of the 137-year old engine shed and workshops at Maespoeth. The Museum is open between 10.30am and 5.00pm on the days that passenger services operate. 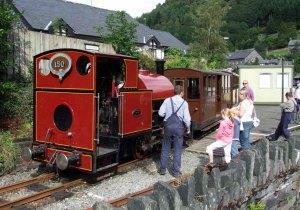 Trains leave Corris Station on the hour from 11:00 to 16:00 (to 15:00 on 19 Oct). Steam hauled trains all dates except 19 April & 19 October. Gravity trains first Sunday of the month May - September at 15:15. 2019 Fares: Adult £6.00, Child (5 - 15) £3.00, Child under 5 Free, Seniors £5.50, Family (2 Adults + 2 Children) £15.00. Corris steam and railway museum is located just off the A487 (Machynlleth - Dolgellau road) and is signposted. The nearest train station is Machynlleth (5 miles), however there is local public transport serving the village of Corris.